Environment preservation has been the main focus of governments across the globe since the past several years. Problems associated with environment mostly occur due to plastic bags that are used for packaging purposes that are not degradable. Consequently, packaging sector has witnessed the trend of biodegradable packaging, where manufacturers are developing eco-friendly packaging solutions. For instance, Oxo-biodegradable bags are a better alternative to ordinary plastic bags that are made of conventional plastic polymers (such as polypropylene, polyethylene, polyvinylchloride, polyethylene terephthalate, etc.). Oxo-biodegradable plastic bags are used in packaging of various products such as pharmaceuticals, snack food products, frozen food products, pet food, cheese packaging and coffee packaging. Several countries encourage the adoption of Oxo-biodegradable plastics as a better alternative to conventional plastic packaging. This has largely contributed to the expansion of oxo-biodegradable plastic packaging market. Countries such as United Arab Emirates and Saudi Arabia have made it mandatory to use plastics that are oxo-biodegradable. This has made it imperative for trading companies to switch towards oxo-biodegradable plastic packaging solutions while dealing with United Arab Emirates and KSA. Middle East and Africa region, thus, has presented high growth opportunities for oxo-biodegradable plastic packaging market. Despite several large-scale manufacturers openly protesting the use of oxo-biodegradable plastics for packaging, small-scale manufacturers continue to market their oxo-biodegradable packaging products as an environment-friendly packaging solution that has appealed to a significant percentage of consumers who are conscious regarding environment health. Oxo-biodegradable films are viewed and marketed by many companies as a crucial solution for packaging waste. Opportunities are thus presented for the expansion of the global oxo-biodegradable plastic packaging market to leverage the ongoing growth spurt. This is more prominent in the Middle East, as well as Asian countries, such as India and China. Moreover, the term “oxo-biodegradable” is being used as a prominent marketing tool. Various manufacturers are marketing their oxo-biodegradable plastic products to enhance their brand image and promote it as an environment conscious entity. In addition, oxo-biodegradable plastic packaging manufacturers are focusing on incorporating additional features to their products, for instance excellent machinability, high printability and ink adhesion and good heat seal strength and moisture barrier. 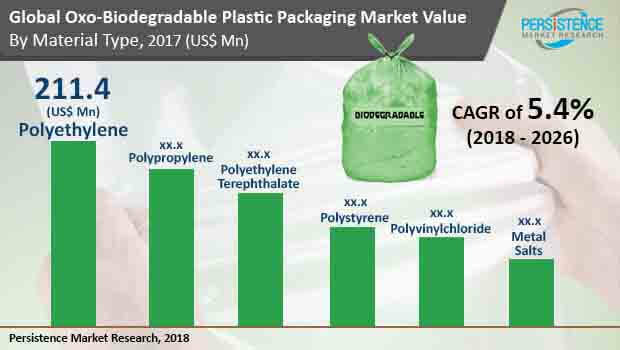 As per this analytical research report, the global market for oxo-biodegradable plastic packaging is poised to expand at a value CAGR of 5.4% during the period of forecast. Analysis of this market speaks about the sales revenue generated and expected to generate during the 2013-2026 timeline. By 2026, the global sales of oxo-biodegradable plastic packaging is estimated to surpass US$ 1 Bn. Polyethylene offers high resilience and strength, the two main factors necessary in effective packaging solutions. High demand for HDPE, LLDPE and LDPE has triggered increased production rate of PE. This has resulted in increased usage of the material in the manufacturing of biodegradable packaging products, such as oxo-biodegradable plastic packaging. In 2013, the market share of polyethylene as a material for oxo-biodegradable packaging was around 32% and is expected to grow in the coming years, to cross 35% by end of the forecast period (2026). By 2026 end, the polyethylene segment is expected to surpass US$ 360 Mn and grow at a high value CAGR during the forecast period. This segment is expected to be the most attractive, observes Persistence Market Research.